We are professional in making the full aluminum foil container production line including the machinery and punching mold for almost 17 years. Our machines have exported to many overseas countries, and have good reputation. Our molds are made according to customer’s samples and confirmed the design of the mold by customer. 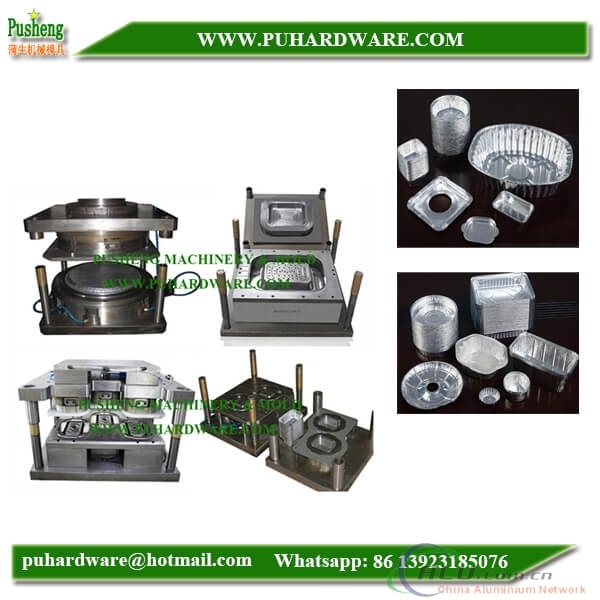 We can make the punching mold for different shape of the aluminum foil containers, Like rectangular foil container mold, round foil container mold, over foil container mold. We also make the punching mold for the foil container covers and lids. All of our mold are packaged by the wooden case or do as customer’s requirement. a. Applicable to the wide area: Manual machine & automatic machine. c. Mold life time: 5,000,000 punchings. a. We could offer different aluminum foil container mold as per your requirements. b. Short delivery time: 45days to 60 days. b. Performance----Pusheng Machinery use high quality machines to guarantee the aluminum foil container mold quality. And it can use 10 years or longer. d. Technical support---- Pusheng Machinery 10 years technicians give you strong and timely support.